Bake them on sticks over the morning fire, then stuff with eggs. Technique here. Don’t forget the jalapeño. Recipe here. Since you’re punching holes into the biscuits, you can make doughnut holes, too. Recipe here. You get to bake them IN AN ORANGE. Recipe here. Beer. Pancakes. I might not even wait for my next camping trip to make these. Recipe here. You make these at home, then reheat over the fire. Recipe here. Made even tastier by woodsmoke. Recipe here. Use whatever fillings you like best. Recipe here. This recipe uses pork and chorizo (or italian sausage). I might cook the ground beef ahead of time. Recipe here. For when you have a couple of hours before you need to eat. Recipe here. 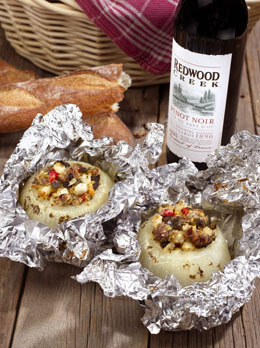 Yeah, stuffed onions. That’s right. Recipe here. Made with my favorite cheese: Gruyère. Recipe here. You’ll need a fork to eat them. Recipe here. 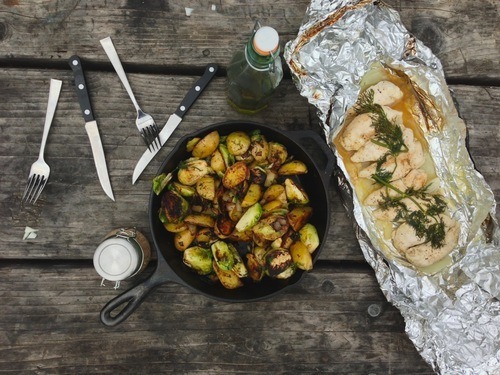 You can do a lot of the chopping and prep for the brussels, potatoes, and onions ahead of time, then proceed to cook when you get to the campsite. Also: it’ll look so beautiful in your cast iron. Recipe here. It takes a few steps, but anything with onions and Italian sausage has to be good. Recipe here. You can prep the pesto, stick the meat in the marinade, and chop your peppers and onions before you head to the campsite. Then when you get to the campsite, all you have to do is thread the meat on and cook. Recipe here. Four easy steps, recipe here. What’s more classic than potatoes over a campfire? You’ll need your fire kind of hot, though. Recipe here. It’s a grill recipe, but you could probably roast them over the fire, then spread on the delicious sour cream mixture. Recipe here. It’s like fondue, but for the outdoors. Recipe here. Add some seasonings to the mix — I love me some paprika — for more flavor. You also will want to use regular popcorn kernels, not those things in the microwaveable bags. Recipe here. You’ll have to do a little prep beforehand, but it’s worth it. Recipe here. You will need a sandwich iron for these. Try adding some ricotta cheese to the fruit for extra creaminess. Recipe here. Not much of a recipe here, but basically you spread Nutella on peanut butter cookies, top with a few bananas, then add your roasted marshmallows. Cobbler: like pie, but without the crust fuss. 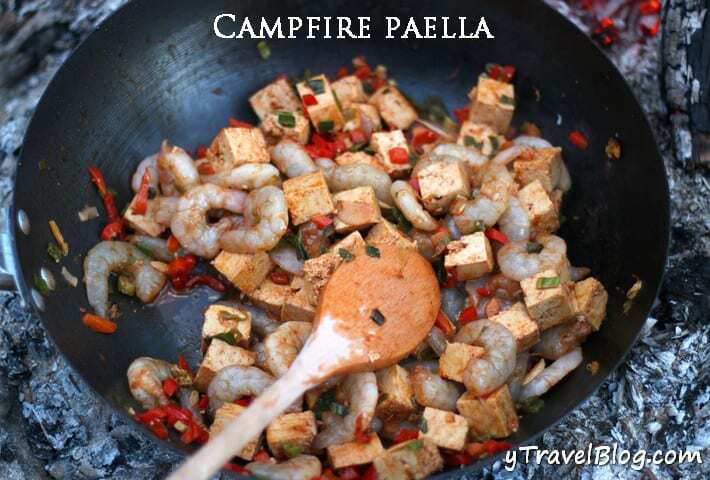 Check out the recipe, and how to convert it to a campfire-friendly recipe. In case you don’t feel like doing the work for a real cobbler. Recipe here. This recipe calls for a grill, but you could easily put them on top of a campfire grate to melt the chocolate, or wrap each of them in foil and nest them in the coals. It’s just apples, roasted and rolled in cinnamon sugar. Hopefully you’re old enough that you don’t need your parent’s help, though. Recipe here. If you’re not sold on this already, I feel sorry for you. Recipe here. Just don’t use the weird berries you found next to your tent. Recipe here. Hot toddies = easiest hot drink ever. (So maybe you’ll forgo the lemon garnish at camp.) Recipe here. A great way to start the morning, assuming you don’t need the whipped cream. Recipe here. Leave out the brandy and the kids can enjoy a glass, too. Recipe here.